Since beginning their musical voyage in 2016, Hello Tut Tut have devoted themselves to developing an authentic Eastern European-inspired aesthetic. 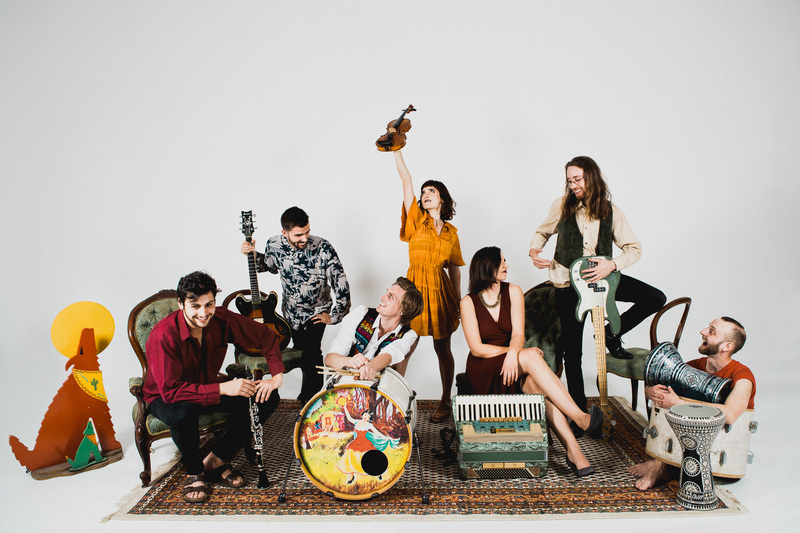 Their debut album, World Music Dance Band is a seamless musical exploration, interweaving the band's distinct influences of traditional gypsy, Balkan, and Klezmer music. The groove of the album’s opening track, ‘Doina’ foreshadows the eclectic soundscape of the record and demonstrates Hello Tut Tut’s ability to juxtapose dynamic with dreamy. From the buoyant rhythm section jams of ‘Samba Tanz’ to the darker, more pensive compositions like ’Sowa Nocna’ Hello Tut Tut turn a switch on inside that you didn’t realise you had, providing a pleasing symmetry of traditional and modern world music. We caught up with the Josh from the band for a deeper look at each track. ‘Doina’ is the opening track of the album. It cleanses your auditory palette and sets the mood for what’s to come. Atmospheric at its core, the piece gradually builds into a vast soundscape by introducing the instruments featured on the album and providing a moment to let your thoughts settle. Traditionally a “doina” is a musical piece played by Eastern Europe musicians and it provides them a quiet moment to connect with their instrument and a platform upon which to introduce themselves to the audience. The “doina” is how we start our live performances and it made sense to begin our album with one too. Welcome to the album! This track builds out of the doina as an epic drum thunderstorm and picks up the pace for the very danceable tracks to come. This is our arrangement of a traditional Klezmer tune we began playing a while ago and features huge drums and percussion with soaring clarinet and violin melodies. The word Tanz is taken from the German or Yiddish languages and means ‘dance’, as you might have already guessed. Using this spelling we emphasize our appreciation for the ancient rhythms that are still present in the more contemporary original music that we create. With the accordion, guitar and bass joining in, this tune turns into an unstoppable dance the size of an elephant. This track is very upbeat and takes its inspiration from an often forgotten yet pivotal historical figure and alchemist named Baal Shem Tov. He was the guiding light at a turning point of Jewish cultural and musical history when he proclaimed that the joyful celebration through music should be at the centre of life. There would not be such a rich Eastern European musical tradition alive today and this band would probably not exist if not for him. This track pays him homage and represents the tail of overcoming adversaries and celebrating the joys of life through music. This is one of those tracks that gets you instantly up and moving. It’s all about the good times and is reminiscent of the hot summer days of yesteryear. The positive vibes in this tune inspired us to shoot a video clip down on Australia’s southern Surf Coast last year. To get the creative juices flowing we spent a weekend at a beach house with a bag of costumes and devised a rough script to fit the tune. A crew from Sydney came down equipped with a Super 8 camera and the challenging goal of recording the whole thing using only 5 rolls of film (which is about 12 minutes of footage). It basically meant we had one chance at nailing each scene... no retakes! If you enjoy the song, check out the video clip! This track is one of our catchiest tunes and includes elements inspired by gypsy, Balkan and electro swing sounds. In the latest recorded version included on this album, we collaborated with a Melbourne based electro swing DJ Max Schollar-Root, whose background as a member of the carni-gypsy outfit Ungus Ungus Ungus made him the ideal collaborator for this track. His beats and effects make this tune a real dance floor hit. ‘Pepper’ is a hard hitting and dynamic party piece inspired by our love for Eastern Europe and Balkan music. It is melodically lead by the clarinet and violin and features the authentic Balkan trumpet playing of Stefan Nocevski. ‘Sowa Nocna’, meaning “Night Owl” in Polish, is a calm breath in an album full of high energy tracks. Performed on a 1938 Steinway Grand Piano by our multi-instrumentalist Stefanie Gumienik, this piece is inspired by composers such as Frederic Chopin and Enrique Granados. This tune features a mysterious character called Jeff. Who’s Jeff? Not many people know as he rarely leaves his corner... This piece is a peek into that corner and is loaded with emotion, rivalry and intrigue. Born was a tune that could well have had juicy lyrics indeed, but, as none of us are singers per se, we tell our stories with our instruments. Sometimes they converse with ease and may exchange sweet words, or other times they erupt in heated discussions. Listen out for the dueling instruments as they move through Tangos to Spaghetti Westerns and back again! Ever wonder what the life of a musician is like? ‘Jobless Romantic’ is a six minute epic insight into the often challenging, yet ever exciting life of your every-day creative type who has thrown away prospects of a “real job” for something much greater. The piece takes you on a journey through styles such as latin, gypsy and dub with a cinematic charm. ‘Rhino’s Daydream’, a beautiful happy daydream space that is intersected by more robust melodies lines and minor gypsy chords. We invited Amadou Suso from The Senegambian Jazz Band with his kora to record with us on this track. The subtle yet rich sounds of the kora complements our instrumentation well. It ends with a beautiful interplay between the electric guitar, the kora and drums that could go on forever. Check out World Music Dance Band above, and head to Facebook to keep up to date with all things Hello Tut Tut.